Today my guest is one of the few people who can make we really weak at the knees for floral nail art - none other than the wonderful Paulina from Paulina's Passions! I've been a fan of Paulina's for almost as long as I've been into nail art it's such a kick for me to have her guesting here! You're going to love what she's come up with for you! Hi everyone! What a pleasure to be here. My name is Paulina and I am running the Paulina's Passion's blog. While Jae is enjoying her awesome vacation, I am taking over her blog to show you a stamping nail art I made. I am especially happy and honored to be doing this guest post, because Jae is one of the nicest ladies in the nail community. I love reading The Procrastinating Polishr, Jae posts are full of humor and nail art always unique and bold! 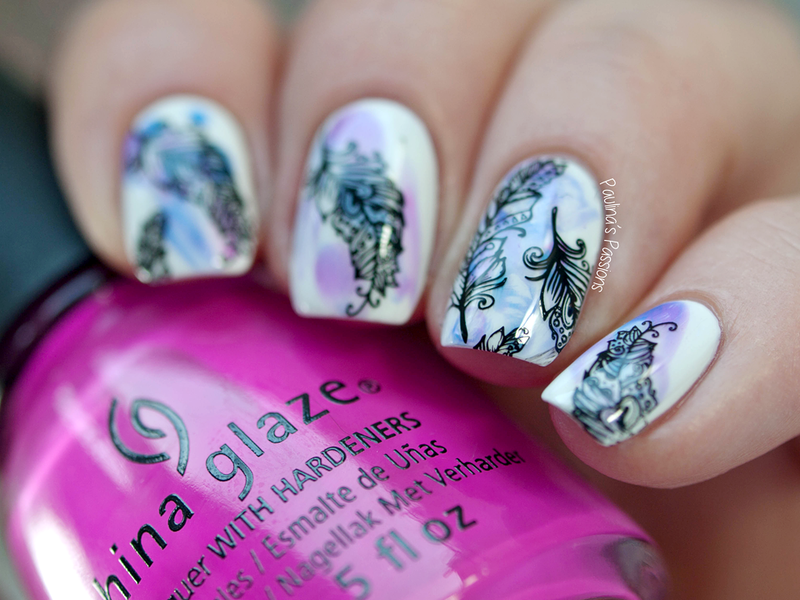 Today I prepared a very simple stamping nail art with watercolor elements. 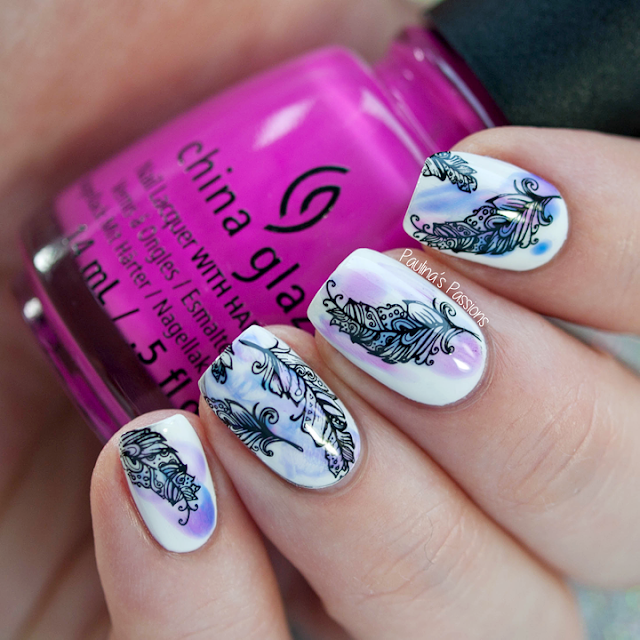 Watercolor nail art is one of my favorite and there are so many different techniques to achieve this effect. For this watercolor nail art I decided to use jelly polishes for a subtle effect. I started off with a white base and I applied two coats of China Glaze White on White. After the base was dry, I applied a layer of fast drying top coat. This is an important step and it prevents the white base from dissolving too much. For the watercolor effect I used three jelly polishes, blue (P2 Gloss Neon Skycoaster), purple (China Glaze Are You Jelly?) and pink (China Glaze You Drive Me Coconuts). I dissolved the colors in acetone and applied random spots with a larger nail art brush. I was striving to achieve random spots across my nails. I stamped the feathers using Bundle Monster BM-S308 from the Festival collection (one of my favorite collections from BM!). At the end I finished the nail art with a layer of top coat. What do you guys think? I am very happy how this watercolor effect came out. It's very subtle and works great as a base for my stamping nail art. Please let me know your thoughts in the comments below and if you enjoyed this nail art, please check out my blog at Paulina's Passions. You can also find me on Facebook, Instagram, Twitter and Pinterest. Don't forget to check out Paulina's Passions via the links just above!